In India, REConnect Energy analyzes data on power generation to predict wind and solar power output and help integrate renewable energy into the grid. In Ghana, a company called Farmerline sends farmers mobile voice and text messages with essential information on weather and crop prices, in several different languages. In Mexico, Medii uses geospatial data on pharmacy locations and prices to help consumers find the medicines they need at reasonable cost. In Indonesia, the website kawalpemilu.org - "guard the election" in Indonesian - uses public data to help volunteers monitor polling stations to ensure that elections are fair. In 70 countries, the Mobile Alliance for Maternal Health (MAMA) connects pregnant women and new mothers to local health services and gives them essential information, reducing death from childbirth and complications of pregnancy. These innovative initiatives are focused on major societal challenges - energy supply, sustainable agriculture, healthcare access, trust in government, and women's health. By using open data from their countries' governments, they're drawing on a free, accessible resource with huge potential. Open government data can help countries both to achieve the SDGs and to monitor their progress. Over the last decade, countries around the world have begun releasing more data about their operations in the interest of good government. Open data on spending, contracting, and operations has helped to improve transparency, accountability, and trust. But beyond promoting transparency, open data can promote social good and drive economic growth. As the above examples show, both for-profit companies and nonprofit organizations are using open data in ways that directly serve the Sustainable Development Goals (the above examples, in order, address Goals 7, 2, 3, 16, and 5). And applications in many other areas are addressing other goals on the list of 17 SDGs as well. Thousands of organizations are now using open data to create new products and services with a social purpose. 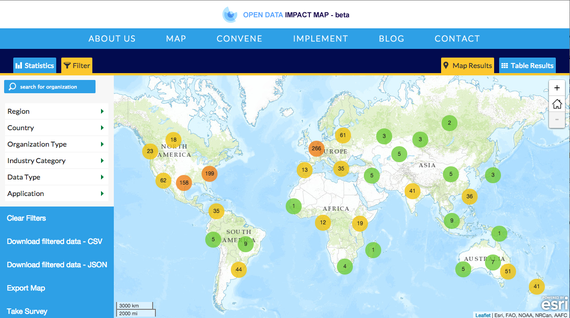 At the Center for Open Data Enterprise, where our mission is to maximize the value of open data as a public resource, we have developed The Open Data Impact Map as part of the Open Data for Development network. This global view now includes over 1,100 organizations using open data in over 80 countries, organized in a database that can be filtered by location, type, industry, and data use. We're continuing to build the Map and expect to have many more examples by the end of the year. The World Bank has also published a new policy paper, "Open Data for Sustainable Development," that shows how open data can help achieve development goals as diverse as economic growth, employment, education, water and sanitation, and urban planning and infrastructure. For example, new lending organizations use open data to provide loans to borrowers with no credit history, thus helping to boost the economy, while job-matching platforms connect employers with potential employees. Data on school funding and performance are helping to develop better schools with better resources. City governments are using open data to improve transportation and other aspects of city infrastructure, and to manage recovery efforts when natural disasters hit their areas. As more and more countries see the power of open data, the list of its uses continues to grow. Ultimately, open data is about data democratization - releasing data for all to use in. It can be applied in any country with a commitment to sharing the power of information, trust between government data providers and data users, and the desire to put the data to use. As nations around the world begin to work toward achieving the Sustainable Development Goals, both governments and citizens will find that open data is a valuable and renewable resource for the work ahead.